Naples is a sprawling city, the cultural capital of southern Italy with almost three millennia of history"not to mention 8,200 pizzerias, architecture influenced by waves of invaders going far back in history from Spain, France, Rome, Arabia, and Greece, more than 450 churches in the historic center, a maze of narrow alleys rich in history and folklore, and some of the most important museums in Italy. It would be impossible to see all the city's treasures in a single day, so here are two walking itineraries to help you discover some of the highlights. The beginning point for both is Via Toledo, a main thoroughfare lined with shops and restaurants running from the royal quarter of Naples to the city's old town. 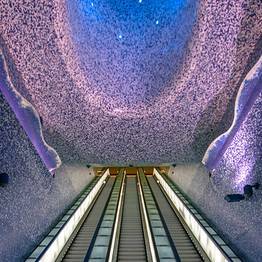 If you are arriving with the Circumvesuviana train at the Piazza Garibaldi station, follow the signs for the Metro Linea 1, and take it towards Piscinola. Get off at the Toledo station, considered one of the most beautiful subway stations in Europe. If you are arriving by ferry, walk up towards Piazza Municipio until you reach La Galleria and the beginning of Via Toledo. 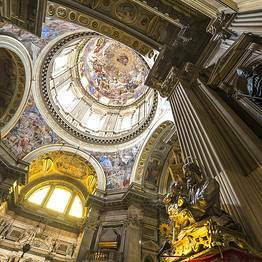 Walk along Via Toledo until you arrive at one of the entrances to Galleria Umberto I; walk through to reach The San Carlo Theater, which connects to the Naples Royal Palace with adjoining gardens. From here, there is a nice view of the Maschio Angioino, the iconic castle that looms over the city's port (if you arrive in the city through the port, it is your first majestic view of the city). If you want to begin sampling Naples' famous cuisine right away, stop at the “Mary” pastry shop at the entrance to the Galleria form Via Toledo and order a traditional sfogliatella or babà. Now continue to the sweeping Piazza del Plebiscito, which stretches across 25,000 square meters and is one of the largest squares in Italy. One one side, the piazza is lined by the Royal Palace, and on the other by Piazza Trieste e Trento and the stunning Church of San Francesco di Paola. In front of the church, the equestrian statues of the Bourbon King Charles III and Ferdinand I by Antonio Canova dominates the square. Traditionally, visitors try to cross this immense space with their eyes covered, passing between these two equestrian statues...you'll find it is almost impossible to do! Where Should I Have Lunch? Street food: there is unlimited options in this area. We recommend la pizza fritta at Zia Esterina (on the corner between Piazza Triste e Trento and Via Nardones), followed by a gelato from Mennella and an espresso from Gambrinus. Lunch with a sea view: continue along Via Santa Lucia to Via Partenope. Here, you can stroll through the historic Borgo Marinaro fishermen's quarter for a fish and seafood lunch, or stop in one of the waterfront pizzerias. We recommend Sorbillo Lievito Madre, on the corner of Piazza Vittoria. From Piazza Vittoria, walk back up Via Calabritto to Piazza dei Martiri, the elegant heart of the city. From here, continue along Via Chiaia back to Piazza Plebiscito where you can take the subway to the train station or return to the port. Walk along Via Toledo in the opposite direction of Piazza del Plebiscito to Piazza Dante. Take a look around the square, then double back to Via Cisterna dell’Olio and take it to Piazza del Gesù. In this square, you will immediately notice the marble "Obelisco dell'Immacolata" and the lovely facade of the Chiesa del Gesù Nuovo, made with a unique decorative motif in volcanic rock. 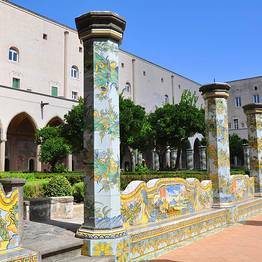 Nearby, the Santa Chiara Monastery is an important example of Neapolitan Gothic architecture, and has a beautiful cloister with ceramic tiling that shouldn't be missed! From the Santa Chiara Monastery, continue along the Decumano Inferiore (also known as Spaccanapoli), the historic Roman road that divides the city of Naples in two. This is the most vibrant street in the historic center, and just steps from the monastery. 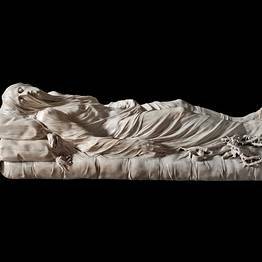 Around the corner of Vico San Domenico Maggiore, the San Severo Chapel is a deconsecrated church that once belonged to the Principi di San Severo, and is rich with Masonic symbols and known primarily for its artistic masterpieces, including the "Veiled Christ" by Giuseppe Sanmartino. Be sure to stop here and admire this important monument and its treasures! There are a number of traditional "friggitorie" in this neighborhood that prepare freshly fried seafood sold in “cuoppi” paper cones, or if you are craving a sweet, try a sfogliatella pastry from Scaturchio in Piazza San Domenico Maggiore or chocolate from Gay Odin. 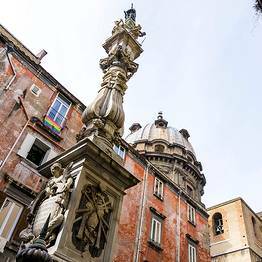 After visiting the San Severo Chapel, go back to Piazza San Domenico Maggiore and continue straight to Piazzetta Nilo. Here you must stop at Bar Nilo and take a snapshot of the display holding a lock of footballer Maradona's hair: an almost spiritual experience for fans from Naples and across the globe! After your espresso break, continue along San Biagio dei Librai until turning left on one of the most characterstic lanes in Naples, San Gregorio Armeno, famous for its artisanal workshops making traditional Nativity scenes. Tiny figurines and Christmas decorations that are both holy and whimsical are sold all year long, though around Christmas the lane becomes so crowded that it's hard to walk. The end of Via San Gregorio Armeno runs into the beginning of Via dei Tribunali, where a number of the most famous pizzerias in Naples are located. Stop in Gino Sorbillo for the best pizza in Naples (matched only by the pizza at Michele a Forcella), but note that lines can stretch up to 2 hours. If that's too long to wait, there are a variety of great alternatives, including Da Matteo or Al Presidente. If you would prefer pasta over pizza, sample traditional Neapolitan dishes at the Trattoria La Campagnola. 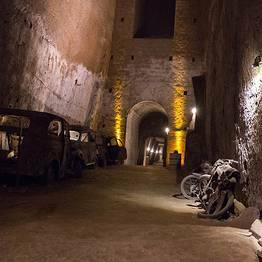 After lunch, purchase tickets for Napoli Sotterranea (Naples Underground), a tour through a warren of tunnels dug out of the tufo bedrock below the city that ends with a hidden treasure: the Greco-Roman theater of Neapolis dating from the 1st century BC where the Emperor Nero performed with his lyre, accessible only through a trapdoor located in the bedroom of a private home! After your tour, continue walking down Via dei Tribunali to Via Duomo where you can visit the city's cathdral. With its blend of Gothic elements from the 14th century and Neogothic from the 1800's, the Cathedral of Santa Maria Assunta (more commonly known as the Duomo of Naples) is the most important religious site in Naples, where the ampul containing theh blood of the city's patron saint San Gennaro is carefully guarded. Three times a year, the city's faithful gather to watch as the blood is miraculously liquified, said to be a sign of good fortune. After visiting the Duomo, stop in the adjacent Museo del Tesoro di San Gennaro, where gems rivalling those of the British Crown Jewels are on display. Your tour of Naples' treasures ends here: continue along Via Duomo towards Corso Umberto I, take a snapshot of the famous work by Jorit that depicts the young San Gennaro covering an entire wall, and head out of the city along the “Rettifilo” (a local nickname for Corso Umberto I). Both the central train station and the port are an easy 15-20 minute walk from here. 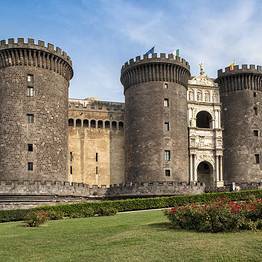 Naples is home to some of the most important museums in Italy, which take hours to visit. A perfect side trip for a rainy day!